When it comes to efficient use of energy, it's tough to beat a bike. That's what Johns Hopkins University engineers learned when they aimed an infrared camera at a computer-controlled bicycle drive train in a campus lab. The camera detected heat generated by friction as the chain moved through the sprockets under varying conditions. This heat represented wasted energy, and by measuring it, the engineers were able to identify sources of inefficiency. In the best test, the chain drive posted an energy efficiency score of 98.6 percent, meaning less than 2 percent of the power used to turn the front sprocket was lost while being transmitted to the rear one. Even the worst test turned in a respectable 81 percent efficiency score. The results surprised faculty member James B. Spicer, who supervised the studies. "This was amazing to me, especially when you realize the essential construction of this chain drive hasn't changed in more than 100 years," says Spicer, an associate professor of materials science and engineering. "The modern safety bicycle with fixed front and rear gears came about in the 1880s. There have been modifications to make the chain work better and last longer, but essentially, it's the same type of drive." 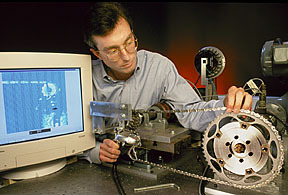 Using electric motors and a computer, James B. Spicer, an associate professor of materials science and engineering, led a team that measured the energy efficiency of a bicycle drive train. To approximate real-life riding in their lab tests, the Johns Hopkins engineers used magnetic brakes to mimic the friction of tires touching the road and the air resistance created by a rider. An electric motor was adjusted to change the speed of the chain drive, simulating slow, moderate and fast pedaling. Although the tests focused on a bicycle drive, the results could have implications for other chain-driven devices, including cafeteria conveyor belts, factory production lines and the movable clothing racks found in dry cleaning shops. The researchers found two factors that seemed to affect the bicycle chain drive's efficiency. Surprisingly, lubrication was not one of them. "The first factor was sprocket size," Spicer says. "The larger the sprocket, the higher the efficiency we recorded." 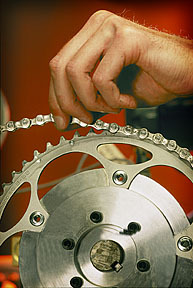 The sprocket is the circular plate whose teeth catch the chain links and move them along. Between the front and rear sprockets, the chain links line up straight. But when the links reach the sprocket, they bend slightly as they curl around the gear. "When the sprocket is larger, the links bend at a smaller angle," Spicer explains. "There's less frictional work, and as a result, less energy is lost." The second factor that affected efficiency was tension in the chain. The higher the chain tension, Spicer says, the higher the efficiency score. "This is actually not in the direction you'd expect, based simply on friction," he says. "It's not clear to us at this time why this occurs." The Johns Hopkins engineers made another interesting discovery when they looked at the role of lubricants. The team purchased three popular products used to "grease" a bicycle chain: a wax-based lubricant, a synthetic oil and a "dry" lithium-based spray lubricant. In lab tests comparing the three products, there was no significant difference in energy efficiency. "Then we removed any lubricant from the chain and ran the test again," Spicer recalls. "We were surprised to find that the efficiency was essentially the same as when it was lubricated." The researcher speculates that a bicycle lubricant does not play a critical role under clean lab conditions, using a brand new chain. But it may contribute to energy efficiency in the rugged outdoors. "The role of the lubricant, as far as we can tell, is to take up space so that dirt doesn't get into the chain," Spicer says. "The lubricant is essentially a clean substance that fills up the spaces so that dirt doesn't get into the critical portions of the chain where the parts are very tightly meshed. But in lab conditions, where there is no dirt, it makes no difference. On the road, we believe the lubricant mostly assumes the role of keeping out dirt, which could very well affect friction in the drive train." The Johns Hopkins team found that the higher the bicycle's chain tension, the higher it scored in energy efficiency. Spicer cautioned that the chain drive is not the only place on a bicycle where energy can be lost because of friction, but it is an important one. The Johns Hopkins engineer wonders why bicycle manufacturers don't advertise the energy efficiency of their products, especially considering that the source of this energy is a human rider. "When you walk into a store and look at appliances, there's usually an energy guide on them, telling you how much it will cost to run the machine for a year. That allows you to make comparisons," Spicer says. "And if you go to an automobile dealer, you can see how many miles per gallon a car is expected to get, and that's essentially a measure of efficiency. So why shouldn't bicycle manufacturers post their energy efficiency?" Participating in the testing program with Spicer were Michael J. Ehrlich, a former Johns Hopkins associate research scientist, and Johns Hopkins engineering graduate students Johanna R. Bernstein and Christopher J. K. Richardson. The tests were supported by a grant from Shimano Inc., a maker of bicycle components. Color slides of the bicycle chain drive test and technical paper available; contact Phil Sneiderman. Follow this link to view a brief infrared movie which shows the heating of the bicycle chain, rear sprockets and derailleur components after the drive begins operation. In the color movie, red is hot, blue is cool. The temperature rise is quite small, just a few degrees Celsius. The movie depicts a slow pedalling speed of 40 RPMs for the front sprocket (not shown in the movie).